If you happen to enjoy a Google Nexus S, HTC Desire S, Sony Ericsson Xperia neo or the upcoming Xperia pro, then Skype 2.0 for Android is just for you. The rest of phone will unfortunately have to wait until the company rolls out the update to them. After you see what has been added, though, it is pretty explicable why the handsets are being updated to Skype 2.0 one by one. The new Android version adds video calling, you can do it over 3G network as well, and you can do it between platforms, i.e. you can video call your friends Nokia from your Android handset. Not that Fring hasn't been offering this for two months now, but it's good to have options. Other items in the changelog include the ability to send text messages from Skype at cheap rates to any mobile in the world, as well as ironing out some bugs and random kinks that were present in the previous version. Some of the quirks aren't solved though, such as "Video calling to the iPad 1 that is using the Skype for iPhone app is currently not working; the call automatically gets downgraded to an audio call." Good to know, in case we want to video call someone with the first iPad. I wonder if someone will hack the apk and release it for other phones like they did for Netflix. 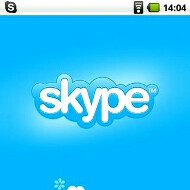 N900 had it from the day it released....... Gtalk And skype vid chat! !